I often get comments on my Instagram asking where a photo was taken. I'm starting this series is in response to those comments. When it comes to photographs, everyone has a preference - a certain style or vibe that makes you fall in love with it. The vibe that I'm obsessed with is an American - summer - teen - IDGAF vibe. A lot of these photos I love are taken in diners or arcades, which is a classic setting for a teen flick. These locations also have really great neon lights, so if you were looking to shoot with a neon background - diners and arcades are where to go. There's a couple arcades in London that I shoot at, but one that I had the most success with was Las Vegas Arcade in Soho. I started shooting there in 2016, but it's gradually gotten busier and busier each time I visit (maybe due to the Supreme store around the corner). This arcade has beautiful cool neon lights. Here's a quick brief rundown of the machines they have for photography purposes; a claw machine, two dance machines, lots of driving machine, pool tables, air hockey, etc. For fun purposes; they have an awesome Japanese button mashing game, Street Fighter, Tekken, Guitar Hero, Time Crisis, etc. When shooting with neon lights, be cautious to take several shots at a time due to the lights flickering. One photo might be really blue, and another dull without the neon light. In here I usually shoot at my widest aperture or if I'm near a machine stop down to f/2.8. Shoot at over 1/100 due to the lights, and adjust your ISO accordingly. You want to blur the background and get really nice bokeh, and to allow as much light as possible because it's quite dark in there. Key places I shoot are the claw machine, the driving games, and the air hockey table. These place are usually the most lit areas (pun intended). 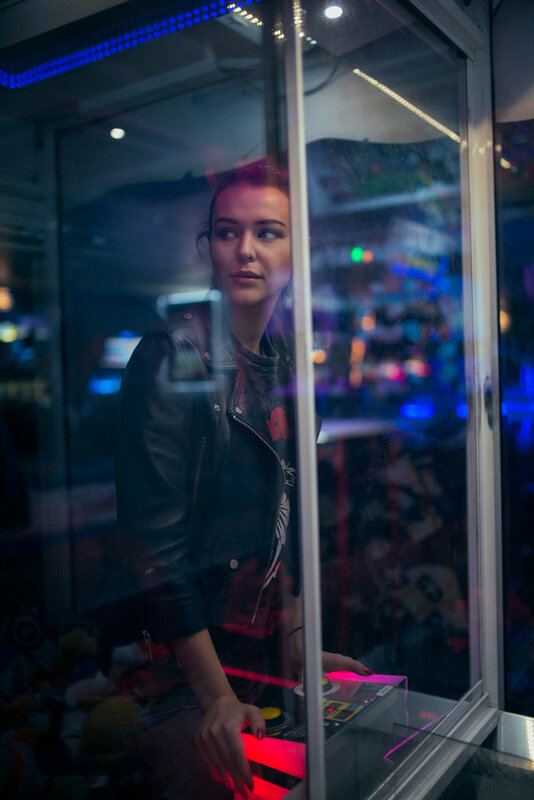 I have found shooting through the glass of the Claw Machine creates really soft reflections that's quite flattering. It's especially handy if it's busy in there, by blurring the background into a beautiful mash of colours.